Calling all Pakistani Designer fans in the North West! The International Foundation For Mother & Child (IFMCH) have teamed up with Manchester's Imani Studio to host an exclusive charity fashion show in aid of the flood victims of Pakistan. 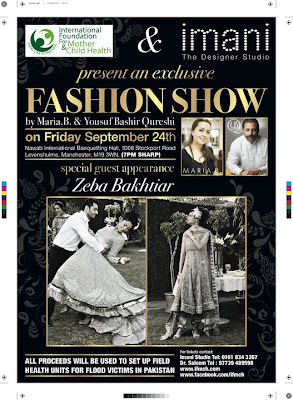 The show will be taking place at Nawab Banqueting Hall on Friday 24th September. Seemed to be a huge event !